I am not immune to the “pumpkin spice bandwagon”. Did I notice the PSL at Starbucks? Why yes I did. Did I have one? Yes and no. I had a sip of my daughter’s drink and realized that is was a bit too sweet for me. Yes! These muffins are a treat – and would be an even better treat with ½ cup of chocolate chips added (please do it). 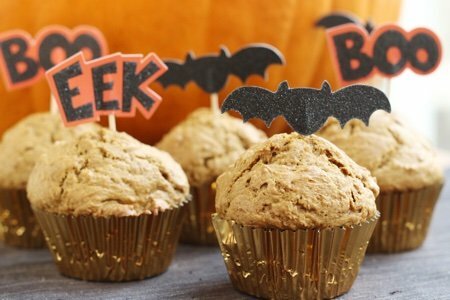 I made these healthier than cupcakes by using whole wheat flour and pumpkin but these are not as healthy as some of my other muffin options because they have about 5 grams more sugar per muffin than is ideal (about 1 teaspoon). I tried reducing the sugar amount but they came out tasteless. The other hint would be to make them smaller. These turned out to be GIGANTIC when I wasn’t looking. I dressed them up like a cupcake so that the kids would not notice they were lacking frosting and the complete fluffiness of an all white flour baked good. What is your favorite pumpkin spiced treat? Preheat oven to 400 F and line a muffin tin liners for 12 muffins. 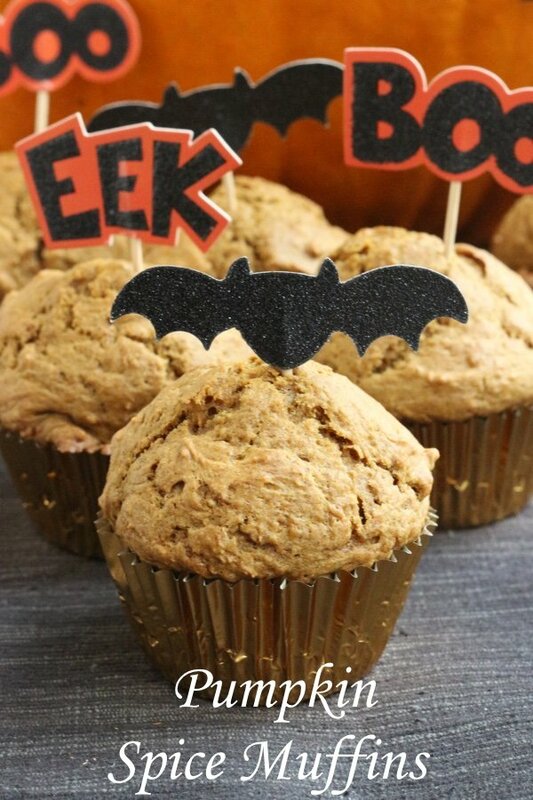 In a large bowl, mix together all-purpose flour, whole wheat flour, baking soda, salt, pumpkin pie spice, and brown sugar. In a medium bowl whisk together butter, eggs, milk, pumpkin, and vanilla extract until well blended. Add liquid mixture to dry mixture and stir until combined. The batter will be very thick. Add batter to muffin cups and fill almost to the top. Bake for 18 minutes or until a knife inserted into the center of the muffin comes out clean. If I added some protein with is. Would it be OK.
Looks good! Is there a big difference between whole wheat flour and "white" whole wheat flour? @Nancy - I haven't tried it but if you have experience with added protein to baked goods - go ahead! @Melissa - No, they are just different grains. White whole wheat is a bit fluffier but you can use WW flour for this and it will work. I add sliced almonds and flaxseed as often as possible. I bet this recipe would like that additional dose of healthy stuff. I add almonds and flaxseed to my smoothies, which makes them more filling and incredibly delicious: now I will add some pumpkin. By the way, I am so grateful for the three bottles of seasoned rice vinegar from Nakano that I won after submitting my suggestion of cucumber, onions, vinegar and water. My kids (who know that I despise cooking) were amazed that I won a recipe contest. Sometimes keeping it simple pays off. recipe instructions are a bit fuzzy. No mention of when to add the brown sugar. Please edit. @Cathleen - sorry about that. I have fixed it. Let me know if you give them a try! Thank you! Thank you for clearing up the recipe instructions. I made them earlier today and they are fantastic. I will be adding diced apple to give them a bit more of a fruit punch as I am feeding them to toddlers. If I were baking them for myself I would be adding raisins!!! If you want that Starbuck pumpkin spice - I have to admit it was delicious get a short w nonfat milk and half the pumps of pumpkin - about 100cal I think! I think it was worth it for a treat! Where can one find WW whole wheat flour? @JoAnne - you can usually find it next to the white flour (and next to the whole wheat flour). LMK if you have trouble. Thanks for your question!